This book was sent to me by Blogging for Books in exchange for a review. It is rather funny to me that I am reading “Christmas” books in November. My family loves to celebrate Thanksgiving in a big way, and Christmas is pretty much AFTER Thanksgiving. But for some reason I’ve allowed myself a little pre Christmas reading. The 13th Gift started out very difficult. It’s a hard but good story about a family who lost husband/dad in October and are facing their first Christmas as four, instead of five. I was a little put off by the coarse language in the opening chapters, but as the story unfolded, I understood better. Grief is powerful, and sometimes the harsher words better communicate the depth of the pain. The story is built around the well known song, The Twelve Days of Christmas. As the story unfolds and the twelve days of Christmas dwindle down to the end of the song, a beautiful healing takes place in the family. Joy and love return, as the family realizes they are not alone, and they are very loved. It is exciting to me that this is a true story. To hear how others have taken their hard things, and turned them into something beautiful for others is an encouragement and a challenge. I am reminded how important it is for me to look around to see who may need a word of kindness, or more, as the holiday season approaches. Gifts to sponsor children and shoeboxes for Operation Christmas Child are important and good. So are the opportunities in our own communities to reach out to those touched by death, divorce or loss of employment. 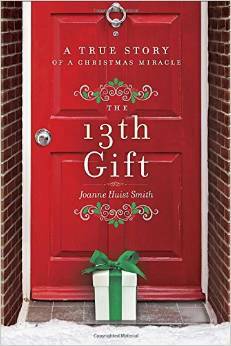 The 13th Gift is a heartwarming story of the power of community love. I have a copy of the book to share with one reader.